I was always bound to love food in Malaysia. With strong influences from China, India and South East Asia, how could anyone not? Having just returned from a wonderful two week visit, I can genuinely say that it has surpassed my expectations. We managed to take in 4 different areas whilst we were there; starting off in the Cameron Highlands, moving on to Penang, then to Langkawi, finishing off in Kuala Lumpur. Malaysia is big and there was definitely more to see, but this gave us a decent cross section of areas so that we were able to at least get a rudimentary feel for Malaysian culture and cuisine. I guess the thing that surprised me the most was how authentic the cuisines seem to have remained. Often when you find a country that has been influenced by other cultures, you’ll find a bit of a fusion thing going on. Look at foods like Cajun and Mexican that have taken local food and completely adapted it with the influence of immigrants and trade routes. You can completely feel the French influence on Vietnamese food just by looking at Banh Mi. But in Malaysia, whilst there were certainly some different interpretations of dishes, you could easily observe the separate Malay, Chinese and Indian cultures. In that way, it was very similar to England, where you have a massive number of differing cultures, but they very much stay true to their routes and you can still find authentic examples of various ethnic dishes. You may not think you know Malaysian food, but you will have definitely encountered some of it. Indian Curries, Laksas and flatbreads abound along with noodle broths, satays and dim sum. One stark difference with the Western word is the way the Malaysians don’t really differentiate menus with different times of the day. Roti (a flatbread made from wholemeal flour) is a staple for breakfast, often with eggs or beef as a filling, or plain with chicken. Sambal, however, is king at breakfast time, it is a coconut infused rice with a rich curry sauce, topped with peanuts, dried anchovies, cucumber, beans, chives and chillies. It may sound odd to have these things for breakfast, but I found myself addicted to it by the end of the trip. We were fortunate to be in Malaysia during Malaysian International Gourmet Festival. This is a time of year when 26 top restaurants around the country offer special menus at special prices with menus encompassing Malaysian, Western Classic, Japanese, Cantonese, Mixed International, Thai & Chinese, Western Continental, French, Latin American, Sri Lankan, Thai, Modern French, and Contemporary Italian. The theme this year was “Galactic Chefs”, which was chosen to embody the spirit of adventure this year’s festival was themed on. We wanted to try the Malaysian, so went to a restaurant called Enak KL. Located in one of the many shopping malls with high-end boutique labels, we were treated to a 5 course menu with matching wines. The highlight for us was the Ikan Lemak Koma-Koma Pedas Cili Padi, John Dory marinuated in Trmeric paired with a saffron-infused sauce simmered with just a hint of fiery chilli and served with red spinach and fresh curry leaves. This was matched with a refreshing Chilean Sauvignon Blanc, which worked well with the creamy sauce and chilli kick. There were far too many great meals to recount, but this is definitely one of them. The Cameron Highlands are an area less known to Westerners, being largely a holiday destination for Malaysians and Chinese tourists. Known for being the last known spot where Jim Thompson famously disappeared, it is now dominated by strawberry and tea farms. Though they are quite well known for their English high teas, the thing that has taken the area by storm is Steamboats. You may have heard of Shabu Shabu or Hot Pots, but it is essentially a flavoured broth kept simmering away at your table by a traditional charcoal cooker, which is now often replaced by electric or gas hobs, this is accompanied by a wide choice of sliced meats, seafood, noodles and vegetables. You just add what you want to the broth, let it simmer for a few minutes to make all kinds of different combinations. It’s like a healthy fondue, really delicious and hugely popular. 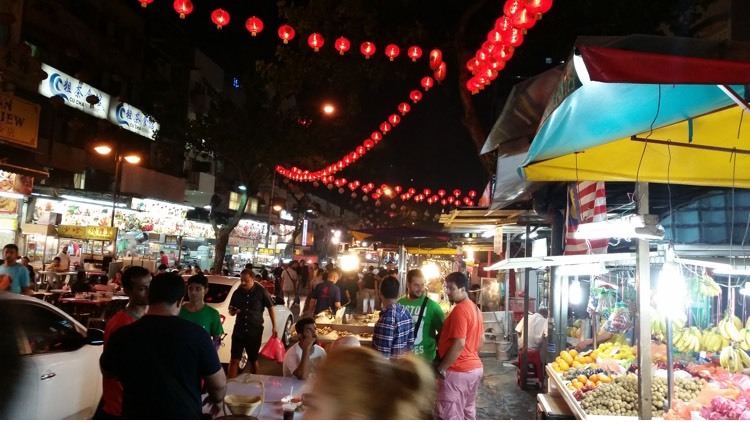 The street is amazing and Penang is considered the street food capital of Malaysia. We found a place called Red Garden Food Paradise, which is a night market with over 40 different stalls set around a central courtyard with live music. You just grab a table and order your drinks, then browse the stalls and order food to be sent back to your table number. We had charcoal grilled satay, clams stir fried in ginger and chilli, oyster omelettes, stir fried chicken bishop’s noses and soft shell crab. Definitely for the adventurous eater, but absolutely worth the experience. My absolute favourite dish in Georgetown, however, was the Peking duck at the E&O. Their famous for this dish and when you taste the rich, succulent dish and homemade plum sauce, you’ll see why. In Langkawi, we had a stunning beef Rendang at the Cliff restaurant, overlooking the beach, but it was the seafood restaurants that were the highlight there. Restaurants with fish tanks containing live fish, lobster and crabs dot the main drag and the steamed snapper with lemongrass and ginger was so delicious, we had it for lunch two days in a row! Kuala Lumpur was littered with options, but we met a local that gave us some great restaurants. Our favourite was a restaurant called Mama San. Award winning Scottish chef Will Meyrick opened his 6th restaurant in KL after achieving great success in Bali and Hong Kong. His simple, Asian street food concept in a restaurant environment has hit the balance between innovative and traditional perfectly. He has dishes from China, Indonesia, Malaysia, Singapore, Thailand, Cambodia and Vietnam. The Nyonya cuisine is a style of food dating back to the Ming Dynasty, when the daughter of the Emperor of China married the Sultan of Malacca, creating a whole new culture blending the Chinese and Malay. Meyrick’s Nyonya seafood, is one of the most divine dishes I ate on the entire trip. Clams, squid and prawns in a beautiful curry sauce with some intense chillies and fresh curry leaves was a little trip to heaven. We loved it so much, we tried to go back on our last night for dinner just so we could have it again, but unfortunately, a power cut meant the restaurant couldn’t serve us. I could write another 10 pages on all the wonderful dishes I tried, people I met, amazing service I received and stunning scenes and culture we were fortunate enough to view, but I hope this little snapshot of our experience encourages some of you to book at trip to Malaysia to try it all for yourself. Two weeks is barely enough time to scratch the surface but I can promise you that it’s a trip you won’t regret.